Is there a better alternative to Ear Practice? Is Ear Practice really the best app in Teaching Tools category? Will Ear Practice work good on macOS 10.13.4? Ear Practice, based on Adium Software's popular Ear Teacher software, is the most sophisticated ear training and sight-singing practice tool yet. 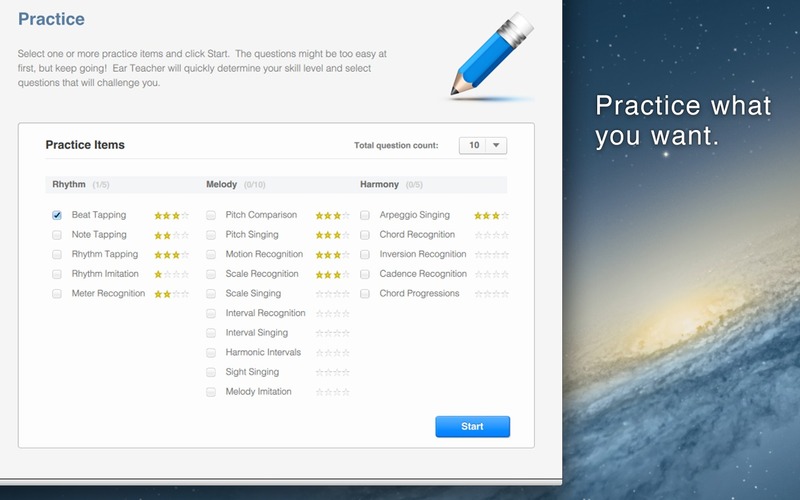 Ear Practice tracks your progress and automatically personalizes each practice session based on your current abilities. This allows you to make the most of your practice time by focusing on just the problem areas. Choose from 20 different practice items, covering: rhythm, relative pitch, sight-singing, melody playback, harmonic dictation, and much more. Use Ear Practice daily, track your statistics, and be amazed at how quickly your skills improve! Ear Practice needs a review. Be the first to review this app and get the discussion started! Ear Practice needs a rating. Be the first to rate this app and get the discussion started! All skills levels - beginner to advanced. 20 practice areas; 1000s of questions. Tap to answer rhythm questions. Sing into your microphone to answer singing questions. Play your instrument to answer melody imitation questions. View statistics and watch yourself improve.